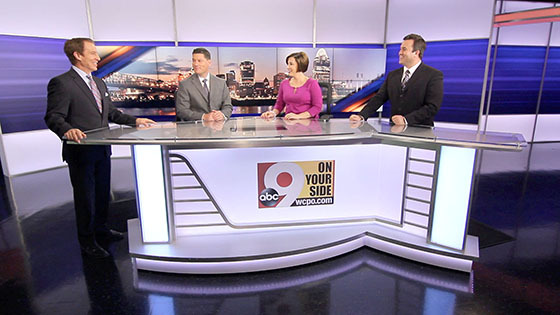 WCPO-TV, the Scripps ABC affiliate in Cincinnati, debuted a new set from Park Place Studio today. The set is comprised of more than 40 vertical light boxes with three horizontal strips of color. The set can change colors, thanks to the use of LED light panels. From breaking news to severe weather, the set can now be color-coded to reflect the urgency of the event. 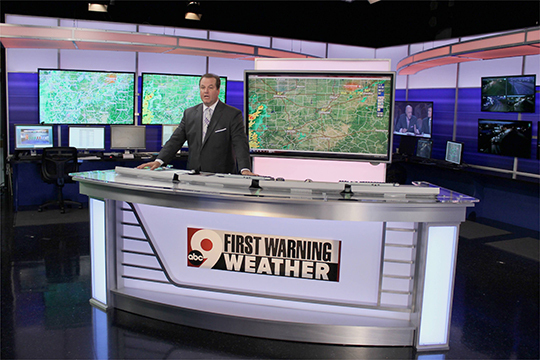 Park Warne, owner of Park Place Studio, worked with WCPO-TV to craft the new design, which will change color to represent different dayparts. “With its video arrays and touchscreen monitors, the set is the most flexible storytelling device Park Place Studio has ever created,” said Bill Brown, creative director of Park Place Studio. The set includes a large amount of technology, including a 5×2 Planar monitor array camera center . The set also includes a 3×3 monitor wall in a multi-purpose/standup area. An interactive weather center is located to the left of the anchor desk. Featuring multiple touch screen integrations, the weather center gives forecasters new tools to track storms. This area is also used for monitoring traffic and showing delays. WCPO-TV also added a live alert center to the set, providing a “dedicated pipeline for breaking news information.” The area allows reporters, producers and anchors to show breaking news faster through large monitor displays. 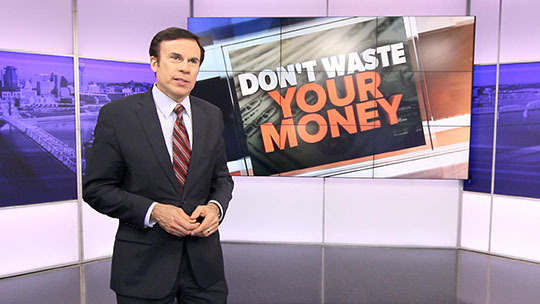 Overall, the set mixes modern technology with a unique color-changing design, allowing maximum flexibility for WCPO-TV.